More than music. More than announcements. SO MUCH MORE IS POSSIBLE! And let's face it... so much more is needed if you're going to have a wedding day worth remembering for all the right reasons. Organization, attention-to-detail, and peace-of-mind are all crucial! If you realize just how important the role of a talented, experienced, yet low-key Master of Ceremonies is to the success of your wedding, then you're definitely looking for much more than "just a DJ." And that's great! You've come to the right place. 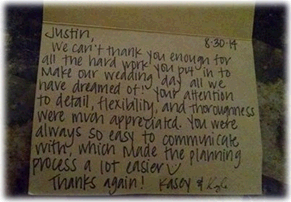 Together, we'll create just the right feel for each part of your celebration - Cocktail hour, dinner & DANCING! We'll include the traditional elements you'd like, and we'll talk about fun and creative personal touches too. Working seamlessly with your other vendors & your venue staff, I'll keep everything on track, and running smoothly behind the scenes. I manage all the details so you don't have to! Your guests will be informed, engaged, and entertained every step of the way. You'll love relaxing and letting loose, as your uniquely-inspired celebration is skillfully guided according to your own personal vision. Wired or wireless fill speaker included, as needed. Extends music and announcements to adjoining areas, patios, etc. to provide full, adequate coverage in large or oddly-shaped areas. Your family & friends will share every moment of your ceremony with you, as they're drawn in with every word spoken, and each heartfelt vow you exchange. Your laughter and tears of joy will be echoed by your guests, bringing you all closer in the most intimate of moments. Multiple wireless microphones and low-profile, state-of-the-art sound design by Bose® ensure your entire ceremony - including any special readings and musical performances - are heard clearly, and enjoyed by all. After your incredible exit, your guests will transition smoothly to your cocktail hour, where the background music of your choosing welcomes them and sets the mood for what's to come. 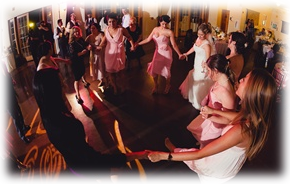 A myriad of classical & contemporary musical options for your ceremony. Choose from traditional options, or mix it up with unique, off-the-beaten-path selections to truly personalize each part of your ceremony, including processionals, interludes, and your recessional. Whether your wedding binder is all loaded up, color-coded, and ready to go, or you just don't know where to start, it's okay! I have all the tools to make sure we get where we need to be for a smooth-flowing, stress-free, and FUN wedding day! 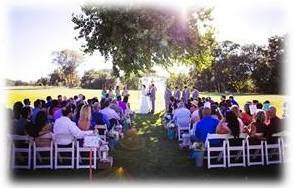 Sample itineraries, nine-page timeline planner, dance music & special event music selection guides, ceremony music ideas, and more! It's all yours at your first, free consultation. At our in-depth planning meetings, we'll discuss & go over these materials. We'll talk about your ideas, answer your questions, and discuss creative ideas and suggestions based on experience to help you realize your vision. The end result of this collaboration will be a highly customized and personalized wedding day experience for you, and your guests. Budget-Minded. Quality-conscious. I'm just guessing here, but I'm thinking this probably sounds like a lot like you. It certainly describes Amy & Kevin! They had a small, intimate, DIY wedding at Brookshire Gardens in El Dorado Hills. No photo booths, no videographer, no lavish props or decor, and no chair covers. 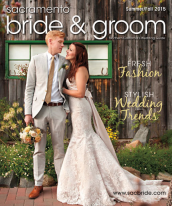 Yet their wedding was still so beautiful, charming, and stylish that their photo shoot by Rachelle Photography made the cover of Sacramento Bride & Groom Magazine. They kept it small, simple & realistic. They prioritized the things that were important to them, and they budgetted accordingly. One of the things Amy & Kevin really wanted was a well-organized, smooth-flowing, and stress free wedding celebration, followed by an AWESOME dance party. And that's what we had! Like Amy & Kevin, you realize an investment in your wedding day entertainment is an investment in the outcome you'd like for your wedding. That's why I'm guessing you see the value in budgeting for quality entertainment, just like they did! After you've taken in the experiences my clients have shared in their reviews, try to imagine yours. If you can't imagine anything different or less for your wedding, then let's chat! After all... that doesn't cost a thing! For your convenience, easy online payments are accepted! Presentation Style | Music | Ceremony Music | Equipment | Karaoke | Projector & Screen | F.A.Q.